Extra dimensions: What's up with that? 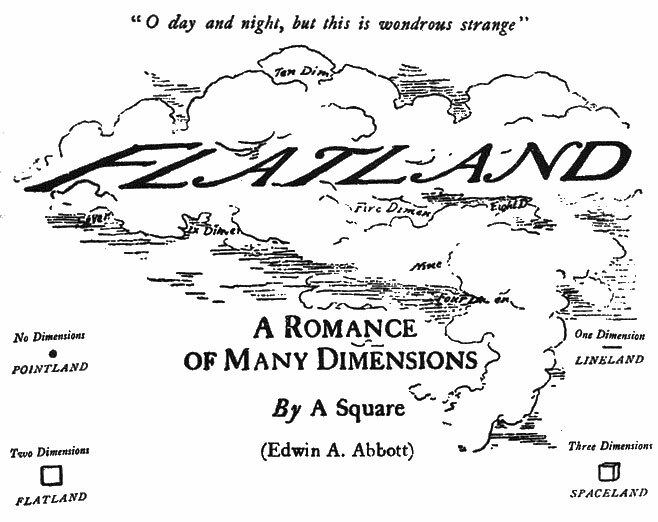 Edwin Abbott's 1884 book Flatland describes in a very easy to understand way the idea of additional dimensions. Extra dimensions pop up again and again in science fiction. For instance, an episode of Star Trek portrays a bearded Spock in a malevolent parallel universe. The idea of evil twins is pretty absurd, so how likely is that extra dimensions are a reality? This scenario makes for an excellent plot device, but the idea of extra dimensions in physics has a more technical meaning. A single dimension is just a direction, like driving on a straight country road. You can go forward or backward. To identify a location in this one dimension, you need just one number. If you stop at a gas station to ask the location of the nearest restaurant, the clerk you talk to will tell you to drive half a mile up the road or a mile back the way you came. If we defined the direction you were originally driving as positive, scientists would say that the location of the restaurant was plus half a mile or minus a mile. We live in more than one dimension. We can go forward or backward, right or left and up or down. For example, to tell someone my location in Wilson Hall, I'd need three bits of information: the east side, on the eighth floor, about 40 feet past the elevators. In order to set up a meeting, we'd also have to specify the time, say 3:30 p.m. Those three bits of spatial information and one time coordinate (east side, eighth floor, 40 feet, 3:30 p.m.) are necessary to identify my location in four dimensions. 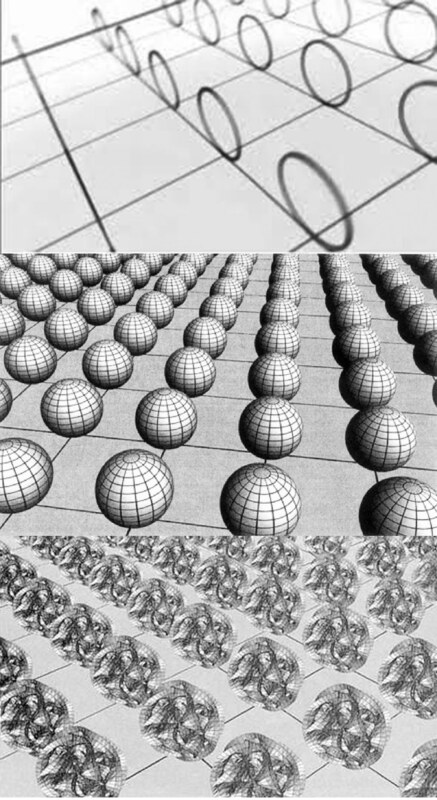 Some modern physics theories postulate that at each spot in our familiar three-dimensional space is inhabited by a tiny physical space that requires additional dimensions to describe. Here, there's one extra dimension (top) or two (middle) or six (bottom). However, physicists talk about additional dimensions. Are they talking about universes containing our hidden evil twins? When you get to your meeting, it's important to face your chair toward me to have an effective conversation. Only one direction, northwest, is facing my desk. We need to add a new dimension and your coordinates would be (east side, eighth floor, 40 feet, 3:30 p.m., northwest direction). In a physics context, the situation is only slightly different. Take a look at the figure to the left. Suppose that at each point in space, there is a little ring. To uniquely identify your location, you'd need to identify the spot in the familiar three dimensions (and one time), but you'd also need to determine your location along the ring. This would add another dimension. If each spot had a little globe located on it, you'd need two additional bits of information (the latitude and longitude on the globe) to locate yourself. This would be 3 + 2 +1 dimensions (normal 3D + globe + time). Extra dimensions pop up in several physics contexts. In superstring theory, the shape located at each spot in space is not a ring or a sphere, but a shape with six additional dimensions, called a Calabi-Yau manifold. 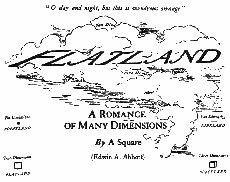 Those small, extra dimensions must be added to the familiar four of time and space. 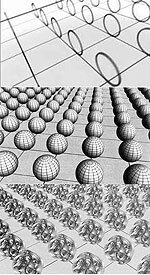 In addition, there are ideas where extra dimensions explain why gravity appears weaker as compared to the other forces studied by physicists. In these scenarios, gravity can leak into the extra dimensions, making it seem weaker in ours. We don't know if extra dimensions actually exist. The theory is that at each point in space, there are tiny extra dimensions that may allow for exotic new physical phenomena. Scientists at the Tevatron and LHC have searched for these extra dimensions, so far without success. We do know that, if they exist, the extra dimensions are small. The searches are ongoing and continue to be refined.